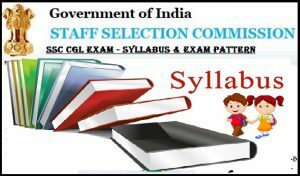 Every year Staff Selection Commission make some changes in their exam pattern and syllabus. Similarly this year also following changes are made. Knowing latest SSC CGL exam pattern and syllabus help you to prepare for your exam in right direct and ultimately this would help you to crack CGL exam with good marks. Here is an important Combined Graduate Level Examination syllabus notification. The notification is about slightly changed in the old exam pattern to new one. It help you to do your preparation more delightfully. You can’t crack and exam if you don’t follow the right way for that particular studies. So here is some useful information for SSC CGL candidates. All candidates are requested to read once changed exam pattern and syllabus for all the Tier-1, Tier-2 and Tier-3 which is given below. Before knowing the exam pattern, you should be eligible for CGL exam 2019. Check out your ssc cgl 2019 exam eligibility criteria. In this phase candidates have to face 100 question of 200 marks. Now this 100 question would be divided into 4 section where each section comprise of 25 questions. For each correct answer candidates get 1 marks and at the same time for each wrong answer, 0.5 mark would deducted. Candidates who qualify tier 1 would able to appear in this phase. Tier II is also an online mode exam in which tier 1 qualifiers have to answer 3 paper where 3rd one is option for everyone except the candidates who are applying for Statistical Investigator/Junior Statistical Officer posts. In paper 1 consists of English questions, Paper 2 consists of Quantitative Abilities type questions and in paper 3 consists of Statistical Methods type questions. All the candidates who have been successfully qualified above two tiers would able to appear in this tier. SSC had introduced same tier in last year (2017). SSC introduce Tier III to check candidates writing skills. In this phase candidates have to answer Descriptive Paper either English or Hindi. This paper consist of 100 marks question in which applicants have to score minimum 33 percentage to qualify Tier III. Descriptive paper consist of 10+2 stranded question. This paper might be consist of essay/ Passage 250 words and letter/ Application writing of Approx 150 words. Anyhow you can check out previous year question paper for more details. Candidates who have been successfully qualified tier I, II & III would be eligible for Tier IV. This Tier is simple as compare to other three Tiers. In this phase candidates have to clear data entry skill test and then finally he/ she successfully pass SSC CGL exam. Data Entry Skill also known as Computer Proficiency Test (CPT). Here candidates have to type 8,000 words in one hour or 2000 words in 15 minutes. Basically this test is introduced to check candidates Data entry speed in computer. If you still have any doubt, you can drop your comments in the comment box. We will be happy to help you.